Jamie and I met on January 29, 2000 at Longhorn Steakhouse in Columbia, South Carolina. I was out with coworkers when I phoned my friend David; he was having dinner wi th his friends. I dicided to join them and little did I know that sitting accross from me at dinner was my future husband. Thanks David!!! After a month or so Jamie and I started hanging out all the time. We had a lot in common. We both wanted to be photographers (him TV and me still), we both had amazing friends and families, and he was by far one of the funniest people I had ever met. I loved everything about him. Except he was the biggest USC fan I had ever met and that was a problem becuase I am huge Clemson fan. We decided to deal with the rivalry...it's only one day a year. In May of 2000, Jamie graduated from USC and moved to Augusta, GA. The following week I moved to Clemson. 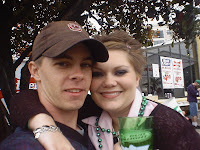 It wasn't long after we both moved that we realized we belonged together and one year later he moved to Greenville. In May of 2 001 Jamie and I bought our first and only addition to our family. The University of South Carolina and Clemson University have one thing in common...both library's have "Cooper" in the name. WOW...wouldn't that be awesome if we called our dog Cooper! Well we did, but not becuase of the library...we actually came up with his name after seeing a billboard while driving to Columbia one weekend. Cooper is a wonderful dog, hell who am I kidding, he is in trouble more than not, but we love him anyway. It seemed like every weekend Jamie and I were going somewhere. I loved these trips. We would just get in the car and drive. W e would go to Braves games, New York City, the beach, but in June of 2002 I made one of the dumbest decisions since I met Jamie. You see I am not a camper, but when Jamie said he wanted to go camping I said I would. We spent 3 days in a tent. We fished, hiked and did all the things you do when you camp. The last night of our trip Jamie proposed and I said YES. We got married on January 4, 2003. It was an amazing day. Not only did I have the wedding of my dreams...I was marrying the man of my dreams. Since then, we moved to Charlotte, NC and bought our first home. Everything was perfect, until September of '07. Jamie and I were so excited because we were expecting what would have been our first child. We went to hear the heart beat and found out we were having twins - identical twins. Unfortunatly something went wrong and we lost both. Even though losing our twins was hard we rallied behind each other and today are able to cherish what is about to happen to our family even more. That being said...Jamie and I are expecting our first child in August. It seems like it was just yesterday when you first walked down to the ballfield with Jamie. (You Dixie Chick Look-alike) We are so happy the impact you have made on Jamie's life as well as ours. We are soooo excited about being first time grandparents!!! Congrats to you guys!!!! I am so happy for you both. Mom passed along the email you sent to her. I loved reading your story. We are so excited for you and can't wait to meet your little boy or girl. You are in our prayers. Hope to see you soon! Thank yo for allowing me to be a part of your miracle. I am so proud of you both. You are in our prayers every day.